Available for Six Month Smiles Providers in the UK and Northern Ireland. Six Month Smiles is the global leader in fixed Short Term Ortho. GDPs can easily ship their impressions via Royal Mail to our UK Intake Centre. EASY shipping process - use Royal Mail. FREE shipping is included with cases. Six Month Smiles believes that everyone can smile with confidence, and every GDP can help. Can Dentists/GDPs like me use the Six Month Smiles system? Absolutely, yes! You can easily do cosmetic ortho using the Six Month Smiles system. Our system is designed specifically for Dentists/GDPs who have little or no orthodontic experience. The vast majority of adult patients are unwilling to undergo traditional orthodontic therapy. The system is the complete solution, making it easy for you to treat these patients with clear braces and provide a teeth straightening service that they really want. How can orthodontic treatment be done in only 6 months? The short term orthodontic treatment goals are not exactly the same as those associated with conventional orthodontics. The most time consuming changes such as altering Angle Class and making significant midline changes are not part of short-term orthodontic treatment. The goal of most Six Month Smiles cases is very similar to most aligner cases: to give the patient a great new smile and to accomplish most, but not all, of what would be done with traditional orthodontic treatment. Our brackets and wires are unique. Lucid Lok™ brackets and wires are specific for short term orthodontic treatment goals. These teeth straightening goals can be achieved efficiently and effectively because the brackets and wires are engineered with a specific prescription and have short term orthodontic unique properties. How does the Six Month Smiles system work? After attending a our training seminar, the first step is to take records on the patient (including impressions, x-rays, and a complete exam). After the records appointment, the impressions of a patient's teeth and a case submission script are sent to the Six Month Smiles Case Processing Facility. 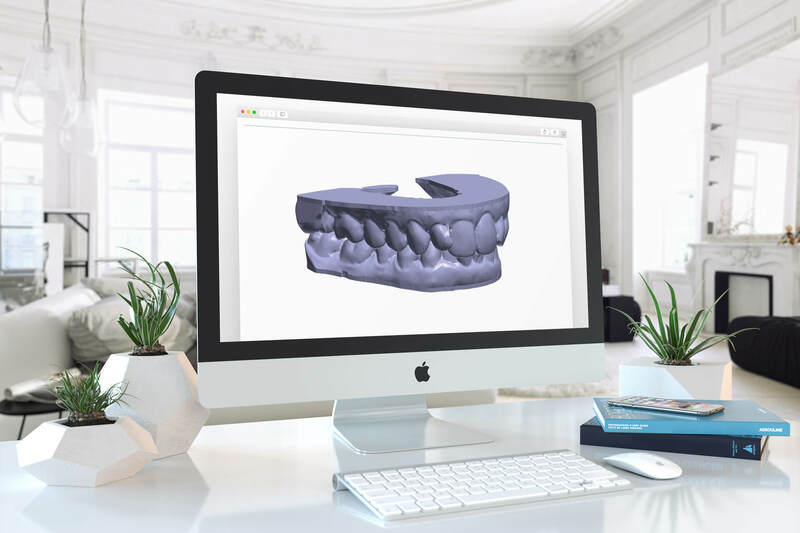 Once the case is received, a bracket specialist identifies the correct location for bracket placement on models of the patient's teeth based on the desired result. Once all of the locations have been determined the bracket specialist carefully places all of the brackets so that the desired orthodontic result will be achieved. The specialist then fabricates custom bonding trays, making bonding the braces to the patient's teeth remarkably easy, efficient and stress free. The bonding trays, appropriate tooth colored wires, ties, and other needed materials are packaged into our Patient Tray Kit. Once the Patient Tray Kit has been assembled, it is returned to the dentist's office ready to use. When the patient comes in for their braces on appointment, the Patient Tray Kit is retrieved and the process begins. After the braces on appointment, the patient is seen every 4 weeks, for a simple adjustment visit. Once the teeth are in the final position, the braces are easily removed and adequate retention is provided. The patient is able to enjoy a smile that looks great and no longer makes them feel self-conscious. Our system is safe, straight-forward and patient focused. Is root resorption a concern with short-term ortho? Root resorption is not of more concern with Six Month Smiles than with any other type of orthodontic treatment. In fact, there is less chance for root resorption for Six Month Smiles cases. Root resorption is typically associated with high forces placed on teeth over a long period of time. With Six Month Smiles, the forces are very light and the treatment times are short. There is simply less time for resorption to occur compared to most traditional orthodontic cases. Is retention different than other forms of orthodontics? Retention at the completion of treatment is the same whether traditional or short-term orthodontics is performed. The methods of retention, both fixed and removable, are also similar, regardless of the two forms of orthodontics. How are the Six Month Smiles brackets and wires unique? Six Month Smiles brackets and wires have been created to specifically address the unique treatment objectives of short-term orthodontics. Effecting desired tooth movements while reducing undesirable ones utilizing straight wires (no bending!) and shorter treatment times requires proprietary, patented designs. The unique shape memory wires work in conjunction with the pre-positioned brackets to brackets to allow for the desired results to be achieved easily and predictably. Lucid Lok™ Brackets. Our unique clear brackets are specifically designed and allow dentists to obtain short-term orthodontic treatment goals with precision and efficiency. The angulations, in-out dimensions and off-sets are specific for these cosmetically focused cases. Also, their uniquely clear translucency blends seamlessly with surrounding tooth structure… and patients love that! Lucid Lok™ Wires: Our wires are tooth-colored shape memory wires that are highly active and provide consistent force levels to gently straighten and align teeth. The unique archform of Lucid Lok™ wires provides for broad but appropriate arches and minimizes the need for IPR in short-term orthodontic cases. Why use Six Month Smiles vs. Aligners? Six Month Smiles is similar to aligners, in that it’s a similar scope of treatment and a similar patient demographic that we’re treating. However, there are some significant benefits of Six Month Smiles to Aligners. Time: Average Treatment time is only 6 Months. Aligners often take longer (1-2 years). Cost: Our lab fees range from $399 to $799. Aligner fees can rage from $1,500 - $2,000. Movement: Broader range of tooth movement. Aligners is limited. (difficult to rotate, intrude or extrude teeth).